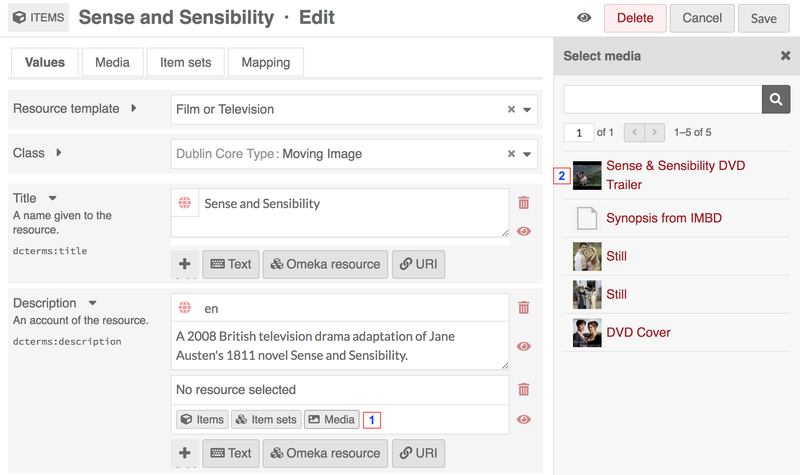 Items are the building blocks of the Omeka system. 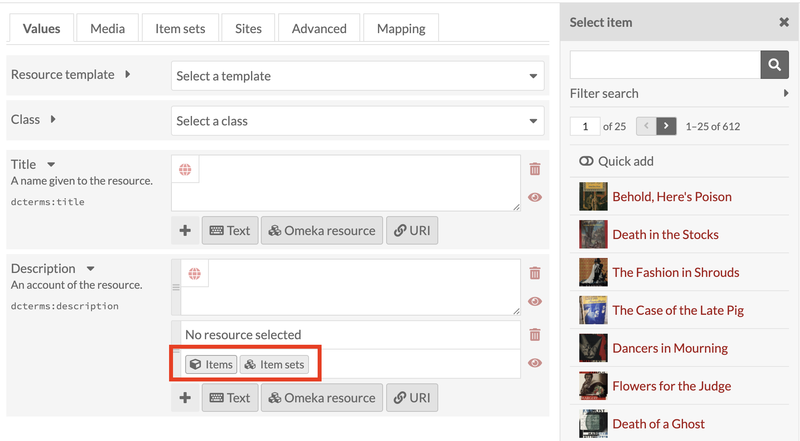 In Omeka S, items can be made available to you from the system administrator, and you may add items to your own site. Items are listed in the Items tab (one box icon), found on the left-hand navigation of the administrative dashboard. and the date the item was Created. Options for navigating and creating items display above the table of items. On the right top of the Items window is the Add new item button. On the left side is a display for the number of pages of items, with forward and back arrows. The current page number is an editable field - enter any valid page number and hit return/enter on your keyboard to go to that page. In the center top is a button for Advanced Search. Just above the table on the right are options for sorting the table of items, with two dropdown menus. The first lets you select between Title, Identifier, Class, Owner, and (Date) Created; the second allows you to sort ascending or descending. To apply, click the sort button. Between these and the table, on the left, is a dropdown for batch actions, including edit selected, edit all, delete selected, and delete all. To quickly view the basic information about an item, click the view details (ellipses) button in the row for the item, located next to the edit and delete buttons. This will open a drawer to the right of the list which displays the item’s title, description, and visibility. For a more detailed look at an individual item, click on its title in the items browse table or when viewing its details. When you view an individual item , there are tabs for the item’s Metadata and its Linked Resources. The right side of the page displays the item’s media, any item sets to which it belongs, its creation date, owner, and visibility. The blue squares indicate where to click to open the full item view. An item’s linked resources (shown below) are resources, which have been added as properties to the item. Note that this section only shows resources which have been linked to this item (which have it for a property); resources which are linked from this item will display in the property which they fill. Linked items are grouped by the property for which they use the current item. 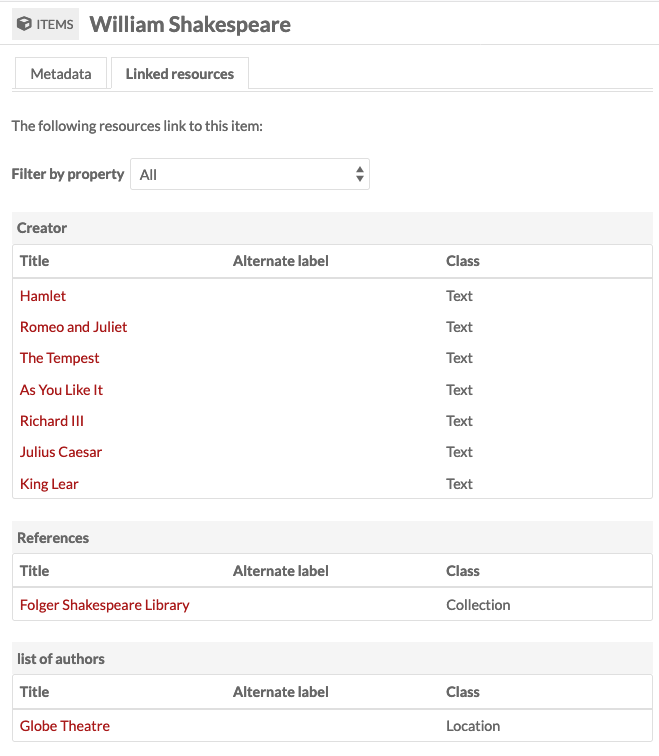 In the example below, the item William Shakespeare is used for the properties "Creator," "References," and "list of authors" for the linked resources. You can filter linked resources to only display those referencing a specific property using the dropdown "Filter by property." It will only display properties actively in use. To add a new item, begin by selecting the the Add new item button. 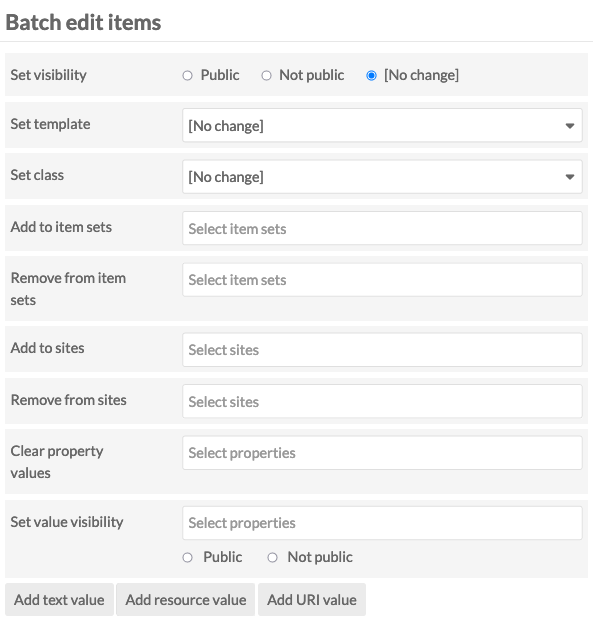 Before creating items, site admins may want to create Resource Templates, which will load specific fields for various item types. The Values tab is where you enter metadata, such as title, description, etc. You can select a resource template from the drop-down menu. Resource templates are defined by the site administrators and editors. If using a resource template, the class should automatically load. If not using a resource template, you may select a class from the dropdown menu (these are populated from the Vocabularies in your installation). Add information to the properties which load. 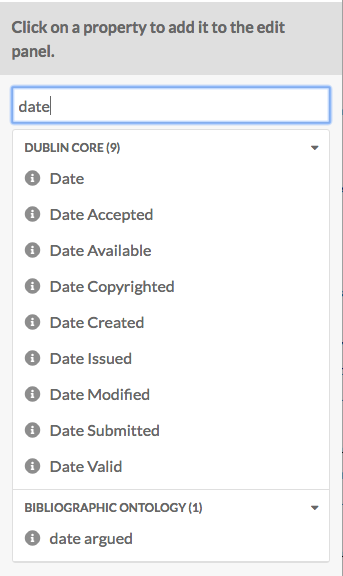 If you do not select a resource template or class, the Dublin Core properties Title and Description will load automatically. You may add text, a resource from the installation, or an external link in each field. Whether or not you use a resource template, you can add more properties to the item using the drawer on the right side of the screen. You can simply click open one of the vocabularies and click on the property you want to add, or you can use the “Filter properties” box to search for a specific property (this is helpful when you have multiple large vocabularies). Clicking on the property label in the drawer will automatically add it to the Item. If you add a property by accident, leave it blank and it will be removed from the item when you save changes. You can set individual properties as Private or Publicly visible using the eye icon for each property. Note that properties set to private are still visible to Global Admins, Site Admins, and Editors will be able to see properties even when set to private. Authors will be able to see all properties on items they own, but will not see private properties created by other users. In the image below, the first property (Title) is public as indicated by the open eye icon. The second property (Description) is private as indicated by the slashed-through eye icon. Clicking or hitting enter on the eye icon toggles between public and private. Text fields allow for unformatted text entry. You can indicate the language for the content of an input using the globe symbol above the input (see the red arrow in the image below). Click on the globe to activate a text field, then enter the IETF Language tag code for the language in which the text is written. 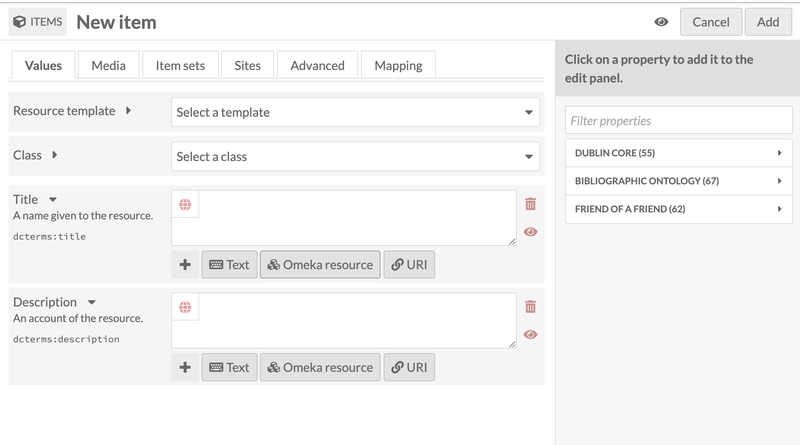 Omeka Resource fields create an internal link between the resource you are creating and the resource which fills that field. When creating an item, you have the option to use either another item or an item set. Choosing a resource type will open a side drawer where you can browse all of those resources in the installation. You can use the search function at the top of the drawer to narrow down the list or to quickly find a specific item. Once you select an item or item set, detailed information will load, and you must click select resource to finish linking the resources. You can also click the X button in the upper right-hand corner to go back to the list of items or item sets. If you are using an Item resource for the property, you will have additional options for finding the item you want in the drawer. Open these options by clicking the triangle button next to the phrase "Filter search"
Filter by item ID: a search field where you can input the ID of the item you want to use. You can find an item's ID in the url of it's edit page; if you are editing the item and the url is admin/item/11547/edit then the item's ID is 11547. Item resources also have an option for "Quick add". When this switch is flipped, all of the items in the drawer have a checkbox. You can use these checkboxes to add multiple items as a property at once. Note that you can only edit one property at a time, so all of the items must populate the same property (ex, Creator, Has Part). URI fields link to an external website or online resource. You may add other fields by selecting a property from the list on the right. 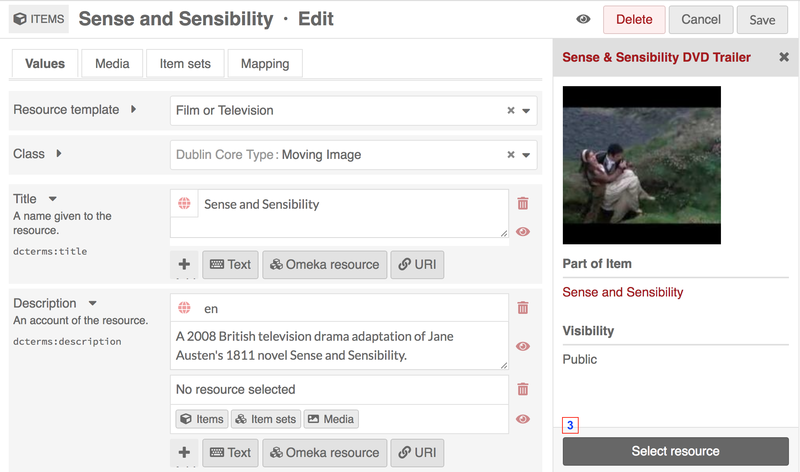 Browse fields by vocabulary (Dublin Core, Bibliographic Ontology, etc), or search in the filter properties bar above the list of properties and vocabularies. You can indicate the language for the content of an input using the globe symbol above the input (see the red arrow in the image below). Click on the globe to activate a text field, then enter the IETF Language tag for the language in which the text is written. 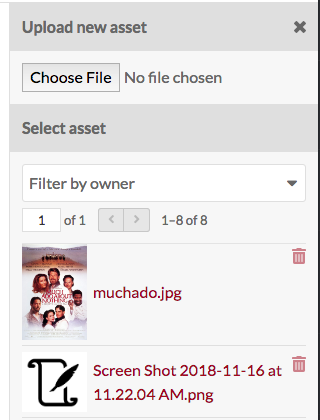 Upload: select a file to upload from your computer. URL: import media via a uri. HTML: add html content as a media resource for your item. IIIF: Add an IIIF image via url. oEmbed: insert an embedded representation of an external URL. Note that this will only work with content from existing oEmbed implementations - use the url in your browser’s location bar. YouTube: add a link to embed a YouTube video. Use the url from your browser’s location bar (with /watch/ in it) rather than the youtu.be link. You can edit media later by going by editing an item, navigating to the media tab, and clicking the edit button (pencil) for a media when editing the item. You can delete any media instance from the item's edit page using the delete button (trashcan) on the upper right corner of the media block. If you have more than one media instance for an item, you can reorder them by dragging and drop each media instance block, using the icon of three lines in the upper left corner of the block as the anchor when dragging. Omeka S uses the topmost media for an item to create thumbnail images for that item on browse and show pages. You can only add items to existing item sets. From the right-hand menu, click on the owner of an item set, then click the name of the item set to add the item to that set. 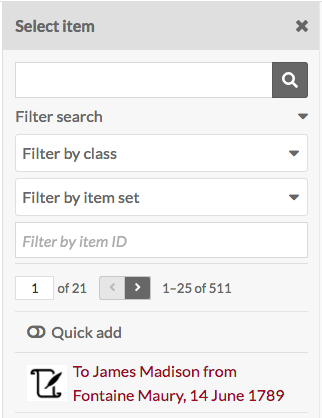 You can also filter item sets using the text entry bar above the list of users. To remove a connection between an item and item set, click the delete (trash can) button to the right of the item set title. 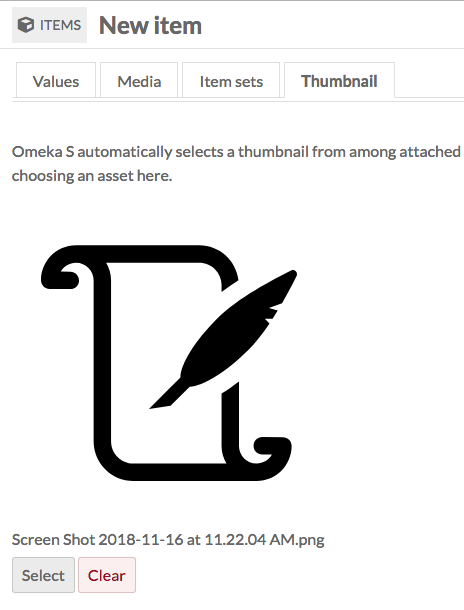 By default, Omeka S will use the topmost media to generate a thumbnail for the item. If you want to use a non-media image for the thumbnail for an item you can set it here. When you use an asset thumbnail instead of uploading media, the asset thumbnail does not display on the item's public show page. This makes such thumbnails useful for items which have no media but which would benefit from a thumbnail for the browse view, or for items whose media does not render an elegant thumbnail, such as audio or visual files. 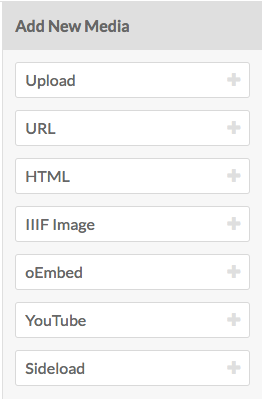 The assets you select from and upload as thumbnails in this tab are the same as those created for site logos. To assign an asset as a thumbnail, click on the Select button in the main work area of the tab. This will open a drawer on the right side. The drawer offers two options: upload a file using your browser, or select from existing assets. To select an existing asset, simply click on it and it will automatically be assigned to the item. To remove an asset which you have assigned as a thumbnail, click the "Clear" button below the image of the asset. To replace it, click select and either choose or upload a new thumbnail asset. 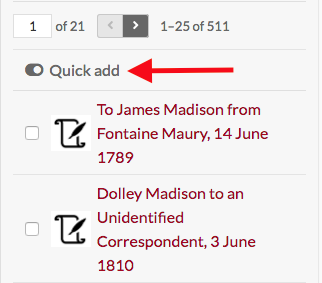 Use the make public/private button (eye icon) to set whether the item is visible to the public or only to users of the Omeka S system. Note that if an item is private, all the media attached is private, but an item which is public can have attached media which are set to be either public or private. Once you have created an item, you can edit it at any time, either by clicking the edit icon (pencil button) or clicking on the item's title and then clicking the Edit button in the upper right-hand corner of the screen. To cancel out of editing, click the Cancel button in the upper right corner, between the Delete and Save buttons. Once you have created an item and added media to it, you will also have the option to use media attached to that item for a property. To use a media resource for a property, select the media option for the element (1). The drawer which opens will display all media attached to the item. Select the media which you want to use(2); this will switch the drawer to just that media (second image). Click the Select Resource button at the bottom of the drawer to complete the process (3). From the browse page of items (admin/item) you can batch edit items, using the dropdown menu on the left near the pagination buttons. You can select multiple items using the checkboxes on the left of each item's row. Choose one of these options and then click Go. set visibility: a dropdown, select from public or not public. set template: a dropdown, select from the installation's resource templates. set class: a dropdown, select from classes of the installed vocabularies. add to item set: a dropdown, select from item sets on the installation. Add to an additional item set using the add another item set button. remove from item set: a dropdown, select from item sets on the installation. 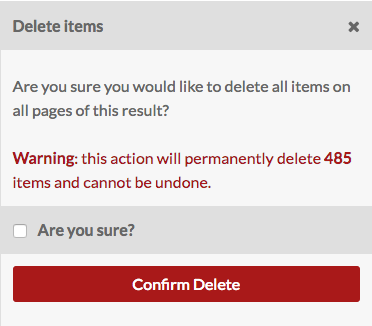 Remove from an additional item set using the remove another item set button. clear property values: a dropdown menu with all the properties in all vocabularies, selecting from this will remove any values in that property in the affected items. Clear additional properties using the Clear another property button. Selecting any of these will add a block to the form where you can select a property from the installed vocabularies and enter the value for that property.